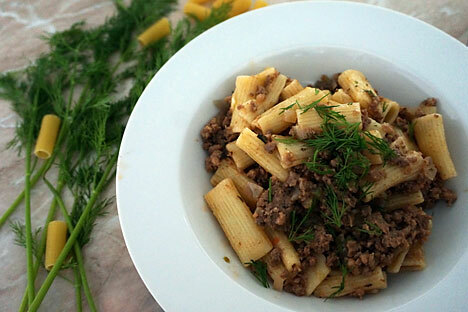 A simple dish of meat and pasta, Makarony po-flotsky was a staple during the Soviet era, with citizens preferring it, possibly because a little goes a long way. There was a period at school when bell bottom pants were all the rage. Looking for ways to fit in, I found a pair of my grandfather’s pants; they were yellow and leathery and went very wide below knee level. I couldn’t have been more excited; I had got the ultimate bell bottoms! My grandfather owned this rather unusual pair of pants (for a Soviet man) because he had served in the navy. In the navy, bell bottoms were common attire for sailors. The navy gave us more than just a relatively brief obsession with the rather inconvenient pants for our rainy, slushy and snowy climate. It also gave us a dish that spread very wide; makarony po-flotsky; or navy-style pasta, which became very popular. Unfortunately, my grandfather is no longer there and I cannot ask him, but Granny says he used to tell her that they really did eat a lot of makarony po-flotsky in the navy. The dish is as simple as can be: fried, minced or canned meat mixed with pasta. No tomatoes, no cheese, no nothing. It is nothing near spaghetti Bolognese, but it it very filling and requires minimum effort. The ingredients are easy to transport and that is probably what made it popular with the navy. “We only had very thick long pasta with a hole back in the day. There were also some ‘seashells’ and a couple other shapes, but no spaghetti or anything like it. The long thick sticks of pasta would just sit in a big open box in shops. One time when your mom was little, I took her to a shop in a town near Moscow and there was a box of pasta on the floor – she quietly took one and started chewing on it without anyone noticing! She thought there were so many that taking one wouldn’t hurt. When you bought pasta sticks, they would be wrapped in a paper cone like a bunch of flowers,” Granny said. Pasta would be boiled till very soft (the concept of al dente came much later and didn’t quite penetrate the Russian kitchen), and often consumed with either cheese or cottage cheese or tomatoes or butter or meat. Granny is not sure when the meat pasta got its “po-flotsky” name, and the Book just calls it “pasta with meat;” another of the Book’s many naming mysteries! These days, spaghetti Bolognese is a signature dish of my husband’s, so I felt a bit shy serving my po-flotsky to him. He is a good man and said it was great. A friend who came over later liked it as well, and now I need a few more volunteers to eat the rest – when you make makarony po-flotsky, there always seems to be enough to feed a small armada! Boil the macaroni or noodles. Put the meat (beef, pork, lamb) through a meat grinder. Season with salt and pepper. Cook in a frying pan over medium heat. When the meat is cooked, put it through the meat grinder again. Add two tablespoons bouillon. You can add chopped onion to the meat. The meat can be boiled or fried. Combine the macaroni or noodles with the egg and cook in a frying pan with butter. Add the meat, top with breadcrumbs and butter, and put in the oven for 15-20 minutes.